Bok choy is also commonly known as Chinese cabbage or snow cabbage. The cultivation of this vegetable dates back 6000 years and the Chinese were the first to use this vegetable in their delectable cuisines. It belongs to the plant family cruciferae, the other members of which are broccoli, cabbages, cauliflower and Brussels sprouts. 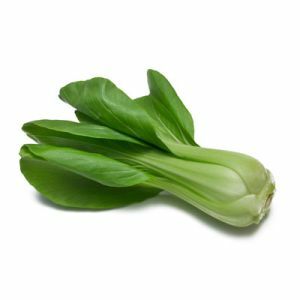 The most popular Chinese vegetable, Bok choy has a light sweet flavor and is extremely versatile it can be stir-fried, Sauteed ( Also see ), steamed or added to soup, Bok choy with noodle. Better still, it’s loaded with nutrients. 1. The lush green leaves of bok choy are ideal for salads and soups for their excellent taste. Besides being known for its great taste, it also has several health benefits. It is a rich source of many essential vitamins like vitamin A, C,and K. Vitamin A is essential for proper functioning of the immune system, improvement of vision and proper growth of bones and teeth, while vitamin K plays a significant role in the coagulation of blood. In addition, Vitamin K facilitates the absorption of calcium and maintains bone density. Vitamin C is a well-known natural antioxidant, which protects the body from the harmful effects of free radicals. 2. Chinese cabbage is a rich source of vitamin D, which facilitates the absorption of calcium and phosphorus, and thereby ensures healthy bones and teeth. It can provide you with sufficient amounts of folate and vitamin B6. Folate is mainly required for proper development of tissues and cells and is associated with lowering the risk of heart diseases. Vitamin B6, on the other hand, is crucial for carbohydrate, fat and protein metabolism and formation of red blood cells and antibodies. 3. In addition to these essential vitamins, it is a significant source of carotenoids like beta-carotene. These carotenoids are known for their antioxidant properties and are believed to reduce the risk of many cancers. Studies conducted in this regard have concluded that consumption of foods rich in beta-carotene may lower the risk of certain types of cancer. Besides this, carotenoids are also beneficial for resolving eye problems like glaucoma and ocular degeneration. 4. Chinese cabbage also contains a high amount of many important minerals including calcium and potassium. Calcium is crucial for healthy bones and teeth, while potassium maintains the electrolyte balance in our body. Potassium may also reduce the risk of circulatory diseases like heart diseases. It is responsible for regulating the blood pressure level. In addition to vitamins and minerals, it is also a good source of dietary fiber. 5. Another important nutritional fact about Chinese cabbage, is that it is fat free and low in sodium, the high amount of which, increases the risk of heart diseases. Many studies have revealed an association between the consumption of cruciferous vegetables like bok choy, cauliflowers and broccoli and reduced risk of developing several cancers. 6. This is because, these vegetables contain a compound called glucosinolates, which is converted into isothiocyanates in our body. Isothiocyanates are believed to be responsible for fighting cancer and improving the immune system. So, this nutritious vegetable can protect you against a number of ailments including heart diseases, cancer and muscular degeneration, besides providing the important nutrients required for carrying out crucial life processes.